The president of the Nigeria Referees Association (NRA), Tade Azeez, has insisted the body will take the necessary steps to enforce its 'zero tolerance' towards corruption. His comments come after the NRA suspended 18 match officials as it investigates alleged misconduct. "We can be proud to state that in the past four years, there has never been an established case of bribe taking raised against Nigeria referees both at home and international levels." 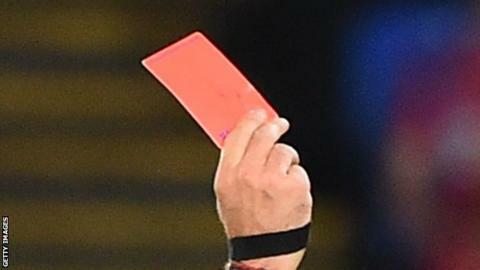 The referees were initially removed from the list of officials for the week 10 fixtures in the Nigerian top-flight, but the suspension will continue during the probe. "We have issued a statement to that effect, the NRA will come out with verdicts after an appropriate investigation," Azeez told BBC Sport. While the NRA confirmed the suspensions and investigation it refused to comment on reports in the local media that claimed to have details of some of the wrongdoing. "The NRA wishes to state that it is deeply committed to the growth of Nigeria football as it has charged referees to operate within the confines of the League Management Committee laws and regulations by adhering strictly to accommodation and feeding procedures allowed," the association said. "Referees shall neither be cowed nor distracted by certain unorthodox antics employed by the real enemies of Nigerian football to easily have their way in the system."